Every year my husband and I go toy shopping for Christmas and every year he stops in front of the toy trains and looks wistfully at the sets. He owned an electric train set when he was a child and looking at the displays brings back fond childhood memories. Even I have memories regarding trains. My brother received one for Christmas and he and my dad spent hours setting up the tracks on a plywood base. Model trains, a classic Christmas toy, can be found circling around Christmas trees all over the world during the holiday season. 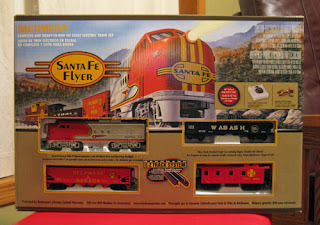 Holiday train shows and special museum exhibits featuring antique and modern electric toy trains draw excited crowds. 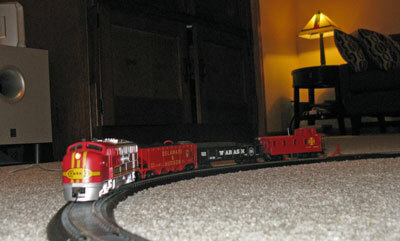 Some even collect model trains as a hobby and join model railroad train clubs. Enjoyed by both young and old, assembling model train sets bond multiple generations together and often the assembly becomes a yearly tradition. Toy trains have stood the test of time, with the earliest toy trains dating back to the 19th century. My husband assembled the track on our carpet within five minutes. With the included track pieces you can construct a 36" circle. It took some skill to place the locomotive correctly on the track, aligning all the wheels properly. After plugging in the power pack, the train did not operate at first. He had to realign the locomotive over the rerailer track before the train would run. The other cars easily coupled together with the locomotive and were also easier to place on the track. The dial speed controller goes from 0-100 and also includes a directional switch. Once we got the locomotive on the track we had no problems operating the train using the speed dial. Our children watched the assembly with excitement and anticipation. Watching closely my husband even allowed them to turn the dial to make the train speed up. The train traveled smoothly on the track without derailing until my toddler decided that he wanted it to stop and knocked it off the track! If you are looking for a Christmas train, Bachmann also manufactures a train called the Yuletide Special . The company also sells a Thomas and Friends line of trains for Thomas the Tank Engine fans. Bachmann trains are available from several retailers including Amazon.com, Walmart, Toys'R'Us, Barnes and Noble and multiple hobby stores. National Model Railroad Association - This large organization promotes the model railroading hobby and the website has a comprehensive guide to model railroading perfect for beginners. And especially exciting news for those of us in Wisconsin - The National Model Railroad Association will host its 75th Anniversary Convention in Milwaukee, WI on July 11-18, 2010. The convention will include a HUGE train show. Sounds like fun! World's Greatest Hobby - A downloadable model railroading guide booklet is available there. What a cool set! My 2 year old LOVES trains! He would like this but is probably too young to be trusted with it!